My friend tore his bicep and it was six weeks before it was significantly better. It really varies so I guess we will see. He should take time with it. Uh no, Hak may play various mind games but he doesn't fake anything. Yeah I read about that, maybe they found a way to keep him feeling good. That or he is in some sweet spot of back health. I hope whatever it is gets consistently better, he is a beast when he feels good. I mean when he moves and reacts things get a lot harder for his opponents. I get the feeling he is injured in some way, he is just way off. 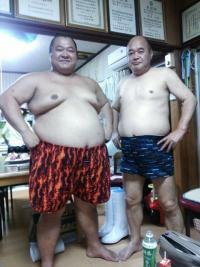 Well they like to say they are focusing on their own brand of sumo style. But yeah the interview speak is pretty limited. I always got the Kotoshogiku bento! If you watch in slow mo Mita does some martial arts blocks and stuff like karate, it was a very quick and decisive set of blocks and then pushing forward. Hak looked totally surprised by that. Thanks, I was going to show my wife who is Japanese, you saved me from the annoyed to translate something look. Yeah I have wondered. I saw her in person and I went out of my way to meet Olympic jiji (gold hat guy). He gave me personalized stickers! I have wondered who she is, I always assumed she was supporting a heya or something. I think his back feels good, when it hurts he can't push or lift and they walk him backwards. I've had the box over the halls where the rikishi walk in and out. 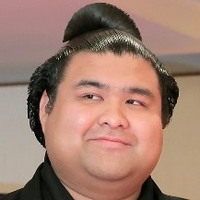 The 6 zabuton were loose at the kokugikan. Those are my favorite boxes since nobody is in front of you and they walk under you, good visibility. However the Abema coverage is annoying with Japanese rap music etc... NHK is good and I always watched it in Japan. Someone had it streaming last night on Youtube so I watched until I fell asleep, not long after Juryo so I watched Moti's as usual for the end. Yeah it's strange how he wasn't doing well in some matches and yet he beat both the front runners. I was thinking he was hurt or something, but by the end he was doing well again.